All are invited to attend!! Good Luck to all the SRLA Runners!! Thank you Nike for the partnership, love, and support. We are putting together the budget for the 2019-2020 school year. Congratulations to all SRLA Runners!! Go Nike!! Nacho Party for 8th graders! 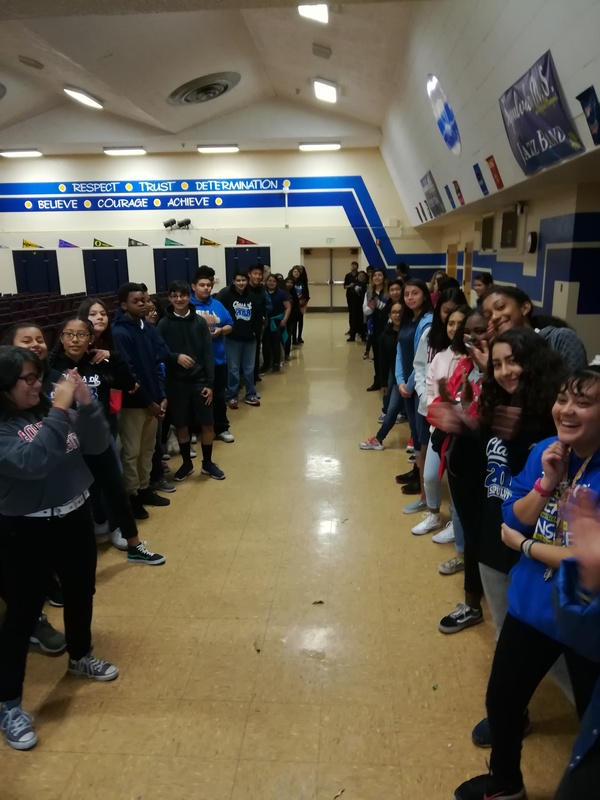 Congratulations to the 226 8th graders that met the requirements to participate in the 8th grade Nacho Party Event on Wednesday, November 28th. We are proud of all your hard work! Keep it up!! Parents and Families! The LAUSD Parent and Family Engagement Policy, the Sepulveda Middle School Parent and Family Engagement Policy, and the Sepulveda Middle School School-Home Compact is being mailed out. Please be sure to watch for these in the mail and to read over the policies. AVID College Fair 2018 a SUCCESS!!! 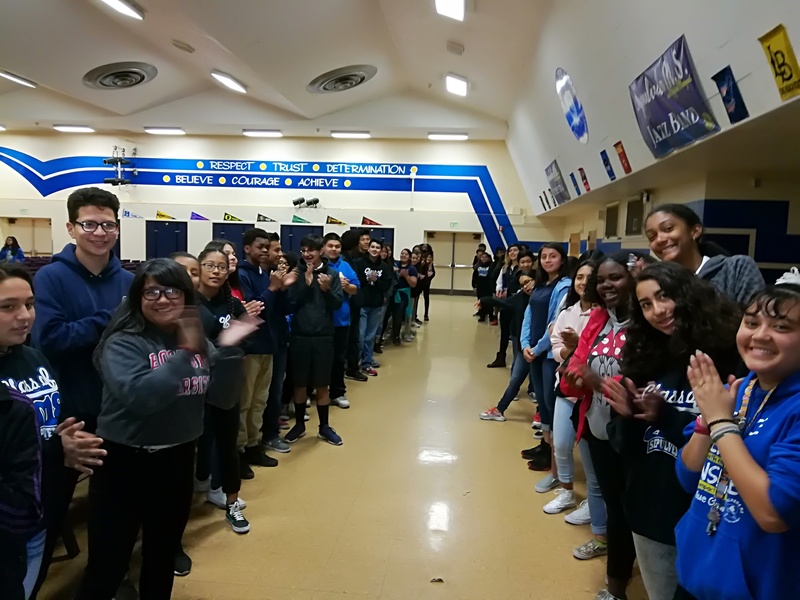 AVID students succeed at informing studetns and visiting 5th and 6th graders from Lassen and Plummer Elementary on higher education options. A special thank you to ALL Outreach Recruiters, Armed Forces, and Councilwoman Monica Rodriguez Field Representative, Juan Solorio. We are meeting every Wednesday and Thursday until competition. We will not have a meeting on October 31 because there is a school dance and it's Halloween.Our theme this year is The 60's! I am so excited, we will have a great time with this subject. Check in with Ms. Roth in room 2 if you have any questions. Sepulveda SRLA students ran the 5K Dodger Stadiuim Run! The first meeting of School Site Council will be held Tuesday, September 4th at 2:50 in the Title I Office--Room 21. Congratulations to Matthew Reyes!!! Matthew competed against a total of 13 teams, including last year's SumoBot champion. Thank you to all participants and all of your dedication! Music, Dancing, and Prizes! Thank you to all who attended. Thank you to all the 8th grade WEB leaders and 6th grade Webbies for joining us at our first ever WEBaganza! We hope everyone enjoyed the popsicles, the music, and the dancing! Special thanks to Ms. Mendez and Mr. Chapman for organizing the event! Congratulations to our three finalists for the Game for Change student Challenge. At the event they will be announcing the winners and awarding prizes onstage at the Student Challenge Awards Ceremony on June 2, where all Finalist games will be showcased in a public Arcade. Everyone is welcome to attend. They are also excited to announce that Anjali Bhimani, who voices Symmetra in the video game Overwatch by Blizzard, will be our emcee for the event! We are very proud of everyone who contributed to this wonderful production. Thank you to stage crew and design for creating beautiful sets. Thank you to all of our actors and actresses for your amazing performance. Thank you to Ms. Raphael for putting everything together. Thank you to everyone who came out to support Sepulveda Middle School's Fiddler on the Roof! This month, ASB created a beautiful display showing their appreciation for Sepulveda Middle School's faculty. The display showcases a variety of iconic films and the some of Sepulveda's star faculty. HAPPY STAFFULTY APPRECIATION WEEK 2018!!! Field Trip to Glendale Community College! Sepulveda Middle School's open house was a huge success! We had the theatre and music department performing on the outdoor stage. Our math, English, science, history, physical education, and elective departments were also displaying their students' wonderful work and activities. Thank you to all who attended and helped at the event. We hope to see everyone next year! Click here to see more of the fun. Make dinner a selfless act by joining us for a fundraiser to support Sepulveda Middle School's PTSA. Come in to the Chipotle at 10384 N. Sepulveda Blvd. Ste 2E in Mission Hills on Thursday, May 24th between 4:00pm and 8:00pm. Bring in this flyer, show it on your smartphone or tell the cashier you're supporting the cause to make sure that 50% of the proceeds will be donated to Sepulveda Middle School's PTSA. We hope to see you there! This month, April, ECO Club and ASB worked together to create a beautiful display case celebrating Earth Day! They did a GREAT job! 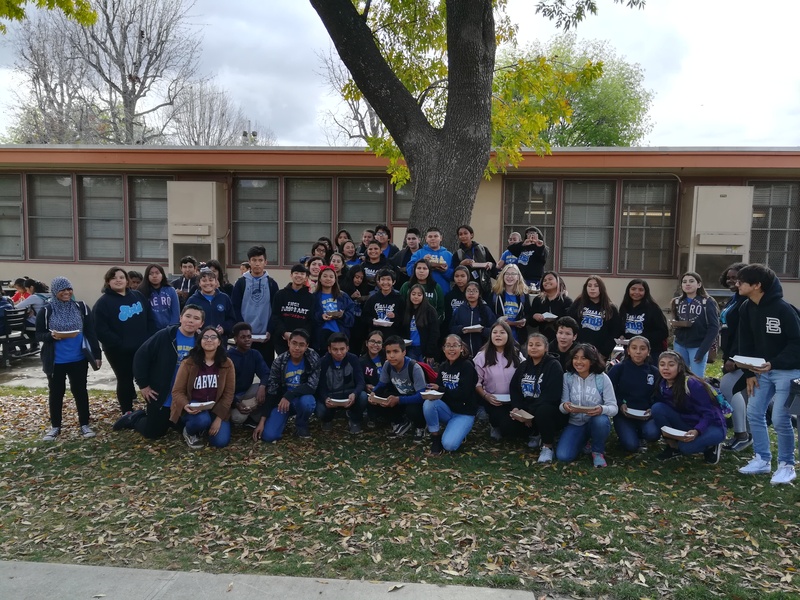 Did you know that Sepulveda Middle School's PTSA fundraises in order to help support our school? 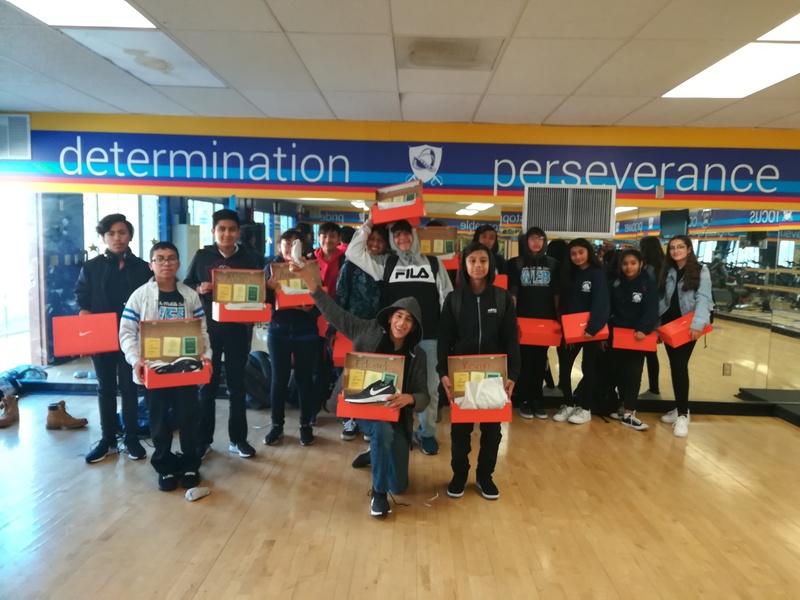 The PTSA raises money to provide teachers and students with supplies they need as well as with fun activities, and more. We currently are in need of members to run for office, and simply to be a part of this amazing organization. Anyone (teachers, students, parents, everyone) can join the PTSA and help improve our school! For more information, please contact Ms. Muratalla in room 52 during homeroom, or email her at amuratal@lausd.net. Join WEB!! Applications are now available!! Magnet Office, HR 96, HR 97, Girls PE Office, and Boys PE Office! !